Spending multipliers are estimates of the impact that government spending has on overall economic activity. They are expressed as the ratio of total additional economic activity arising from an initial boost to spending. Estimating spending multipliers is tricky and can be done using a range of techniques. It is especially difficult to isolate the direct effect of spending measures on wider economic activity, because of the two-way relationships between these variables. Spending typically reacts automatically to the business cycle through so-called “automatic stabilizers” (spending on unemployment benefits, for example). But government spending can also respond to the cycle in a discretionary way (for example, through actively procyclical or countercyclical fiscal policy). Standard approaches to estimating multipliers avail of so-called “SVAR” approaches and structural models of the economy. However, there is no consensus on the ideal way to identify such shocks and, hence, there is little agreement in the literature on the size of multipliers. Differences across countries are also evident, given factors such as how open an economy is to imports, which can offset the economic impact of a boost to government spending. 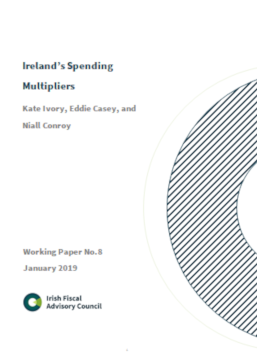 The paper’s results show that government spending may have positive and significant initial impacts on Irish economic activity, though these effects tend to disappear and/or become statistically insignificant over the longer term. Caution is warranted. We find large differences in fiscal multiplier estimates, and we find very limited evidence that the effects are significant in the medium to long run. While this is to be expected in the case of a small open economy such as Ireland, where higher imports can offset the overall impact on output, it underscores the need for caution in drawing strong inferences from the results.